Stéphane, Funny that you asked about French rum (spelled rhum in French) after what happened to me a couple of weeks ago: Around 5:00 PM I was waiting for my bus 151 in front of my office building and it was deadly windy and cold, around 15 F, in Chicago. Standing next to me was a poor fellow who works in my building and he was sneezing and coughing, obviously hit by the early symptoms of a cold. He turned to me and said something to that matter and that he was going home and take two aspirins. I said:” better drink a grog, it’s the best natural preventive remedy I know against the early stage of a cold”. He looked at me, puzzled, and asked: “what’s that?” So I told him the recipe: ”In a coffee mug pour 1,5 oz of good quality rum, amber or gold, add 1,5 Tb of lemon juice, 1Tb of honey, a slice of lemon, and pour hot water almost up to the rim. Stir the drink and sip it while it’s warm.” He said: Sounds good. I will try it but I never had rum in my life, what should I buy? ”And my answer was:” if you want to buy a bottle just to make a few “grogs” any decent industrial rum, preferably “amber”, “gold” or “aged”, from a commercial brand from the Caribbean Islands will do: Barbancourt from Haiti, Mount Gay from Barbados, Myer’s from Jamaica, Cruzan from St. Croix, U.S. Virgin Islands, Bambu from Antigua, or less preferably Bacardi from Porto Rico. But, if you don’t mind paying a little more money, and might want to enjoy that rum in other more relaxed and festive occasions than to take care of a cold, get yourself a bottle of Rhum Agricole de la Martinique, preferably “ambré”, or even better “ vieux” (old) from famous distillers like CLEMENT, BALLY, ST. JAMES, NEISSON, or LA FAVORITE. You will not regret it and I am ready to bet that after trying one of them, you will go back for more and will enjoy drinking them neat, as you would for an old bourbon, or a brandy”. I did not see this guy again since, and I do not know if he followed my advice. In France, in street cafés and bars, they use an inexpensive plain dark or golden “industrial” rum to prepare grogs. Americans until recently, have preferred light, especially white, or golden rums that they can mix in cocktails, like daiquiris, planter’s punch, Pina Coladas, Cuba libre, or Bacardis. They also enjoy drinking spiced or flavored rums. Captain Morgan is one of the biggest commercial success in that category. But over the last 3 years, sophisticated and expensive rums have become trendy, especially in fancy bars and dance clubs. And a new class of rum drinkers has emerged: They prefer drinking “neat”, as after-dinner drinks, dark without the addition of caramel, usually “pot distilled” and aged in oak casks, age-dated rums coming from the best distilleries from producing areas such as Haiti, Martinique, Guadeloupe, Guyana, Barbados, the British Virgin Islands, and Venezuela. For these connoisseurs aged dark rums are as enjoyable as good cognacs and armagnacs An amusing detail: Even though in France, in cafés and “bars-tabac” (see one of my earlier postings on the subject of French cafés and bars-tabac) many patrons used to drink grogs at the “comptoir” during harsh winter days when it was very cold and humid outside, this drink is not a French invention but an English one. The Royal Navy used to provide its sailors daily rations of brandy while at sea on long voyages. The purpose was not only to boost their morale but also to give a more acceptable flavor and cover the bad smell and taste of the “fresh water” on board that, after several days of navigation, used to get spoiled in its wooden tanks. In the 17Th century the Navy replaced the brandy with rum. But the negative impact of that strong liquor on the performance, discipline, and health of the sailors gave the idea to the famous Admiral Edward Vernon, nicknamed “Old Grog”, to mix water with the rum. Then the Royal Navy added lemon or lime juice to the daily rations since this combination not only delayed the spoilage of the water but also, the vitamin C contained in the lemon helped to protect the men from diseases like scurvy. Rum started to be consumed in England in the middle of the 17th century. Most probably it was coming from the English-speaking Caribbean island of BARBADOS, perhaps the first place on earth where rum was distilled. Good rum is a product coming from the distillation of fermented juice or syrup coming from the sugar contained in the fibrous stalks of sugar cane, a perennial tall grass that some experts think was first growing in New Guinea (Papua) or Indonesia. The Latin name for sugarcane is Saccharum. Therefore it is often thought that the three last letters of that Latin word are at the origin of the name of the spirit . But in England they think that the word rum derives from Rumbullion, a word from the 17h century meaning “ great tumult” . This word, as well as the expression ‘’kill-devil’’, was used in the British Caribbean Islands to define rum that had the bad reputation to give nasty headaches and excite the bad behavior of its consumers. Nowadays many people agree that the growing of sugar cane was extended in several Asian regions by the Chinese and introduced to the Middle-East (and North Africa) by Arabs. That is where the French catholic crusaders found it and they brought it back with them to Europe. The Spanish, who call rum ‘ron’’, planted sugarcane in the Canary Islands, as early as the 12th or 13th century, and Christopher Columbus brought some cane from the Canaries to Hispaniola, an island shared nowadays by the Dominican Republic and Haiti, in 1493. In turn, the Portuguese conquistadors and colonizers brought sugar cane to Brazil. When the ever growing demand for sugar boomed in the 17th century, all the Caribbean islands, as well as countries of Central and South America, benefiting from the same ideal climatic conditions for this kind of cultivation, that had been colonized by the Dutch, the British, the French, the Spanish, and the Portuguese, expanded their plantations of sugar cane and subsequently of sugar mills. In the mid 1600’s , they started to ferment and distill the residual byproducts of crushed sugar cane (after extraction of the sugar juice) , and it produced a heavy gooey syrup called “molasses”. It is at that time that rum was born. As a matter of fact the majority of industrial and even some good quality rums produced in the Caribbean, Central and South America, are based on the distillation from molasses. Only in the French Antilles, and more particularly in the islands of Martinique, Guadeloupe, and Marie Galante, is very high quality rum produced exclusively from the pure fresh juice from the cane. This rum is called RHUM AGRICOLE. Its production is very strictly controlled and these rums benefit, like some French cheeses, from an AOC (Apellation d’Origine Controlée) label. (see later in this article) Even though rum is produced in countries as diverse as Australia, Canada, Taiwan, the Philippines, Newfoundland, or Hawaii, the largest concentration of rum distillers is nevertheless located in 17 islands of the Caribbean Basin. The largest producers being Barbados, Puerto Rico, Antigua, Cuba, Jamaica, Trinidad and Tobago, La Martinique, La Guadeloupe, the Dominican Republic, the Virgin Islands (both U.S. and British). Some noteworthy producers are also found all over Central America, and in a lesser way in some South American countries, the best rums coming from Nicaragua, Guatemala, Guyana and Venezuela. Brazil produces a lot of light cheap rum (Cachaca) Some European countries like France, the U.K, Germany and Austria import rums from the Caribbean and age, blend, and bottle them. But they are most of the time 2nd quality industrial rum. Two additional historical notes: 1. From 1750 to the American Revolution, they were about 40 distilleries in New England making rum from molasses shipped from Caribbean sugar plantations. Then the British started to tax heavily the import of nay molasses not produced in a British islands or territories. The French did not like the loss of this lucrative markets and, as you know, enthusiastically assisted the New England revolutionaries in their fight against the Brits. 2. Rum was unfortunately used as a tool of the slave trade since the rum made in New England and the Caribbean was used as a payment of West African slaves, who were then sent to the plantations of The Caribbean, and South America to work in sugar cane fields and sugar mills. When, some years ago, your mother and I visited St. Croix in the U.S. Virgin Islands there were many historical sites, including a museum and some old sugar mills, reminding us that this island was a major clearing and exchange center for both the rum and slave trade between West Africa, North America and Europe, particularly Denmark that for many years was ruling St. Croix. What are the major types of rums produced in Martinique ? La Martinique is an island located in the ‘lesser Antilles” in the Caribbean Sea, half-way between Puerto Rico and the Venezuelan coast. It has the administrative statute of a full-fledge French “departement”. The first French settlers came to Martinique in 1635. They started to export sugar around 1650. But it is the invention in 1694 by a Dominican Priest, Father Labat, of a still that will allow local sugar plants to distill the molasses. In 1767 there were 450 sugar mills in Martinique. But after 1870, the prices of sugar collapsed. And later on, in the middle of the 20th century, when a large part of the cane sugar consumed by the French was progressively replaced by sugar coming from beets, most of the sugar plantations and mills in Martinique went bankrupt. Their owners then in order to survive, got the idea to distill the fresh fermented juice extracted directly from the cane. The RHUM AGRICOLE was born and a real rum industry replaced the purely sugar-producing one. The appellation DOC for Rhum agricole was obtained in 1996. In the fifties there were around 100 distilleries left in Martinique. In 2006, only 9 of them are still active. Rhum Agricole, that is produced either from “gros sirop” (a natural dripped “brut” sugar), or from a “sirop de batterie”, which is high concentration cane juice The cane harvest takes place in the first months of the year when the tropical weather is dry at a time when the canes are reaching their ultimate level of maturity. The harvest used to be done by hand, but now is most of the time mechanized. The stalks of cane are pressed in horizontal mills to expel the juice. The fibrous residues, called “bagasse”, are dried and burned to provide heat for the stills. The first juice called VESOU, is fermented in large vats to become sort of a wine. Then when the fermentation is complete, the Vesou is distilled in single-column copper stills made by the same French coppersmiths that build stills for Cognac producers. The resulting RHUM has an alcoholic rating of around 70%. Often it is mixed with water to reduce its alcoholic content to 50 or 60% (100 to 120 proof). It is a very transparent spirit that will stay in large vats for 2 to 6 months, to let all its natural aromas develop. At that time a part of this batch will be bottled and is sold as “rhum blanc” (white rhum). It is used mainly straight as a before dinner ‘’apéritif’’ and in cocktails and punches, etc. Some rhums blancs are also aged. But when they start to get a darker hue, they are treated to become transparent again. The best rhums blancs come from a stage of distillation called ‘’coeur de chauffe’’. They are consumed in their youth when their velvety fresh aromas are still potent. The second part of the batch is put in oak barrels to age. All kind of different barrels, new and used, made of different kind of woods, generating various levels of tannins, vanillin, smoke flavors, are used to produce specific bouquets and distinctive aromas. If it is aged for more than 3 years, this kind of rhum can be labeled RHUM VIEUX (Old Rhum). Its beautiful different shades of colors also come from the type of wood used in the barrel. Some rhums vieux are 30 or even 50 years old. But they must be aged at least 4 years to be called VSOP and 6 years minimum for an XO ( Hors d’âge) appellation . · If this RHUM AGRICOLE is made exclusively from distilled freshly squeezed sugarcane juice, it can earn the label of Rhum Agricole de la Martinique (or de la Guadeloupe), Appellation d’Origine Contrôlée. So be suspicious of labels saying imported from France. Over the last few years, a slightly caramelized white rum, called ‘’ambré’’ or ‘’rhum paille’(if it is not caramelized), aged for around 18 months, including a few in oak vats, is getting more and more popular. Each French province has its own Christmas culinary traditions, but my favorites are the ones from PROVENCE. I have been dreaming for many years to be able to return to my native area in the South of France at Christmas time and to indulge in one of those traditional special Provençal ‘Repas Gras” eaten when people return home from Midnight mass. But I am not even sure that these traditional feasts still exist. Even though each region of France has its own Christmas culinary traditions that vary often according to the products that are grown and produced locally, there is no doubt in my mind that until the fifties, Provence, along with Alsace, had the richest ones. In Alsace, river and lake fish like pike, carp, or trout, as well as foie gras (an institution there since it was practically invented in that region), are often followed by roasted goose with sauerkraut or red cabbage. The desserts are either ‘’bredle”. special cookies flavored with aniseed, cinnamon and almonds, Kugelhopf a nicely clock-shaped cake, or Bierawecka, a spicy fruit cake, as well as cherry soup. The fish dishes can be enjoyed with a good Riesling, the foie gras with Tokay (a pinot gris), the goose with Pinot noir, rosé or red, or a Riesling Grand Cru and the cake and pastries with Gewürztraminer or an Alsace Grand Cru Vendanges Tardives, that can also produce a good match for Foie gras en brioche. Some of the best wines from Alsace are not exported to the United-States, the level of their production and a lack of exporting structures would not allow it. But a few reliable more “commercial” Alsatian producers that I like whose wines can be found in the U.S. are: TRIMBACH, Domaines SCHLUMBERGER, KUENTZ, HUGEL, Domaines WEINBACH. In Brittany, special Christmas crepes are of course part of the meal. The 13 desserts were essentially fresh fruits like pomegranates, tangerines, apples, pears, winter melon. Dried fruits like figs and dates and sometimes late harvest grapes. Nuts, like almonds and walnuts. This special mix of dried fruits and nuts is still called “Le mendiant” (the beggar). And of course there would be some typical regional sweets and candies, including white or black Nougat (a special candy made of sugar, honey, almonds, hazelnuts, and candied fruit,) that is a specialty of Montélimar, Calissons d’Aix (a semi-soft candy made of melon and almonds paste. Pâtes de fruits (candied fruit paste), and some pastries like mini fruit tarts and the traditional ‘’Pompe à l’huile”, a special soft sweet bread made with olive oil. The adults would drink “vin cuit” (spiced cooked wine) with these desserts. Some of these desserts would be set aside on a separate small table in case the house would have the visit of some poor people from the village, beggars, or ghosts of the ancestors of the house. Then some more spiced wine would be put into the fire, the log would be removed from the fireplace, and put on the side where it would slowly consume itself until New Year’s Eve. Or sometimes it would be wrapped and saved until next Christmas as a good luck charm. The formula for the “Gros Souper” was different from one city or village to the other according to the type of vegetables and fruits produced in the family’s garden or by the local farmers. In some families, this was the only meal on Christmas Eve. But in many others the “real thing” would be served after the midnight mass under the form of a “Repas Gras” (fat meal). It would be the ultimate “repas de réveillon”, as described in “Lettres de mon moulin”, and include game, fowl, roasts (goose, turkey, or capon, stuffed or simply roasted), and a vegetable baked dish of blets or cardoons, quite often “au gratin”. A cheese course would sometimes follow, essentially made of regional goat cheeses. The meal would end with the famous “ bûche de Noël”. The “ bûche de Noël” is in fact inspired by the traditional Christmas log mentioned earlier. It is still served traditionally at the end of any Repas de réveillon de Noël all over France. It is basically a rolled sponge cake in butter cream completely covered with a chocolate or vanilla cream coating. Some plastic figurines, dwarfs, Santa Claus, angels, reindeers, or little mushroom-shaped meringues, are implanted on top. Nowadays, lots of families prefer an iced (refrigerated) version called “bûche glaçée”. Needless to say, the next day, on December 25, cooking for lunch would be a little less elaborate. If there were guests perhaps a home-made rabbit terrine, or a “brouillade de truffes” (a truffled omelet with “crème fraiche”) would be served as a first course, followed by a roasted capon with some simple vegetables (peas, green beans, carrots, sautéed potatoes) and a salad. For dessert ,some left-over from the bûche and the “treize desserts” would be brought back to the table. And for dinner, “aigo-boulido”, the traditional simple but very tasty provençal garlic soup, would soothe overstuffed stomachs. You Grand Maman Maes, my mother, like her mother before, was quite a good cook. In fact I learned a lot from them just watching them in the kitchen. Since we were not catholics, but calvinist protestants, there was no midnight mass for us to attend on Christmas Eve. We all went to listen to my father’s (a minister) beautiful Christmas service on Christmas morning around 10:00 AM. So the ‘‘réveillon” dinner would usually be served at around 8:00 PM. First we would drink some very good ‘’brut’’ Champagne as an aperitif , most often from KRUG, with home- made ‘’friands” or ‘’feuilletés au jambon et au fromage”. These were delicious amuses-bouche made of a delicate and slightly crunchy puff pastry interspersed with tiny flakes of ham or bacon, or laced with gruyère cheese. Then we would sit down for the first course that was often either Coquilles Saint-Jacques gratinées or Vols-au-Vent aux ris-de-veau. She baked the fresh Saint-Jacques (sea scallops) in their own shells with their beautiful red coral still attached, in a velvety butter, cream, and mushroom sauce, and covered with a light breading and a touch of melted cheese which got slightly “gratineed”. The Vols-au-Vent, delicate puff-pastry shells, were filled with tiny pieces of ris-de-veau (sweetbreads), mushrooms, and sometimes tiny shrimps, in a delicate and light béchamel sauce enhanced by a touch of white or sherry wine. A few times we had instead some very good “foie gras” as a first course. Next came the main dish: The dinde rôtie farcie au marrons (Roasted turkey with a chestnut stuffing). These birds were not as huge as their American counterparts, maybe 7 or 8 pounds at the most. But they were very juicy from both a frequent basting and the internal stuffing. That stuffing was composed of cooked peeled chestnuts, the sautéed chopped liver of the turkey, some pork sausage, tiny cubes of soft stale bread softened in a little milk, parsley, sautéed chopped onions, shallots and garlic, a little cream, cognac, thyme, sage, and of course salt and pepper. I do not remember if she put celery in it. But since I hate celery and I have a beautiful memory of that stuffing, I doubt that she used celery. I believe that sometimes she might have added an egg yolk. The whole thing was mixed in a bowl with some broth or water. The result, after around 2 or 3 hours of roasting in the oven was delicious. The accompanying vegetable dish was often a “gratin de cardons”, a very typical dish from the area of Geneva, Switzerland where my mother was from. The cardon (cardoon) belongs to the same family as artichokes. The leaves of Its long prickly whitish stalks need to be removed. Then thorough peeling, cleaning and brushing, is necessary, before cutting the stalks in small pieces and boiling them in salted water with some lemon juice. Then they are baked in a hot oven in a dish covered with béchamel sauce, lightly spiced up with nutmeg, topped with a little grated Swiss cheese, and tiny nuts of butter. The taste and the texture of this dish, which I found out was imported by the colonists of New England in the 17th century, but never became popular in the U.S, are quite unique. Then we would have a salad of lettuce and Belgian endives, with walnuts and a classic vinaigrette. Followed by an excellent cheese platter, that would always have some specialties from my mother’s region of origin, Vacherin, Reblochon, and authentic Swiss Gruyère, as well as more pungent cheeses like Pont-l’évèque, Roquefort, and Camembert, that my father preferred. And of course we would finish with the “bûche de Noël” , accompanied by sorbets and “tuiles aux amandes” (a crusty buttery cookie with almonds that my mother was famous for). The bûche and sorbets came from a very good pastry shop. 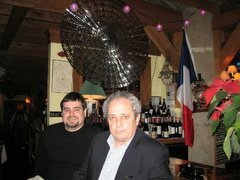 As for the wines we drank:My father in these days was very “Bordeaux-oriented”. So, as far as I remember, we drank essentially Pauillac and St. Estèphe wines with the turkey and the cheese courses. For the appetizers, I think that we might have occasionally drank some white Bourgogne (Burgundy), but I do not remember what kind,. But most probably we continued with Champagne during the first course. What is served in contemporary “diners de réveillon” in big cities like Paris? Nowadays, the French who attend Midnight Mass have become a minority. The catholic church has lost a lot of its past influence on the daily life and on the traditions of France. In any case most churches celebrate “Midnight mass” much earlier in the evening so that parishioners can go home and eat the traditional diner de réveillon. As a first course, most Parisians eat either Oysters on the half-shell, smoked salmon, (preferably wild, not farmed-raised), lobster (steamed, cold, with a home-made spicy or lemony mayonnaise) , boudin blanc, but most often the all time favorite: duck or goose foie gras. My brother Luc serves usually both oysters and foie gras. Foie gras is served in all kinds of forms and preparations: warm or cold, fresh pan-seared with a reduction of Banyuls wine, in terrines, sliced from a can and served with an exotic preserve or condiment, fully cooked “au torchon”, half-cooked, etc.. Many people order either a foie gras, whole or half, from their local butcher or “Charcutier-traiteur” , already prepared and pre-cooked. Some go through the extensive labor of love of buying a fresh one and cook it themselves. Some buy “sous-vide” (vacuum packed), or “confit” in its own fat in a jar, or simply in a can. The canned one has to come from a reputable company, generally from Alsace or the South-West of France (Dordogne or Gers, for example) and be really a “bloc” of pure foie gras, rather than a mixed kind of pâté or ballotine that could contain very little foie gras but all kinds of different ground and pureed pieces, including some pork products. Fresh foie gras is very expensive. A good quality canned or preserved “bloc de foie gras” from a good supplier can also be very expensive. In the U.S. the best foie gras one come from the Hudson River Valley in the state of New York. As you probably know, the sale of foie gras has been banned in Chicago restaurants following a stupid law voted by the City Council some months ago. Boudin blanc is one of my favorite Christmas first courses. It is a very delicate soft sausage encased in a very thin natural casing. It is made of finely chopped good quality white meat from veal and chicken, mixed with some veal fat, eggs, cream, a touch of flour, soft bread soaked in milk, seasoned with pepper, nutmeg, salt, possibly chives and parsley. Sometimes it can be flavored with a little wine or brandy, and, for the more fancy one, flakes of sliced black truffles and/ or crushed hazelnut. It is gently pan fried and can be served, warm, with mashed apples. Recently, Chapon rôti (roasted capon) has become a favorite main course. But many people stick to the traditional roasted turkey, or less often goose. The most popular stuffing, or served separately as a side accompaniment is “ marrons” (chestnuts). You can find them fresh, shelled or not, peeled and pre-cooked in jars, or even canned. In the last case one of the most well-known French producer is Faugier. But fancy small vegetables like midget potatoes, peas, mini-carrots, cooked lettuce or cabbage, turnips and salsifis (oyster plant), are also served as an accompaniment. Sautéed mushrooms of all kinds are still very popular. A fancy salad of “Mesclun” (various types of lettuce and greens) is often served after the main course, usually dressed with a special vinaigrette, based on champagne vinegar for example, and spiced-up with exotic ground pepper. Some nuts, pieces of smoked duck magret, or cheese, can be added. Next is a cheese course (see my article on cheese trays on this blog). A basic good platter should at least include a camembert au lait cru (see my post on this blog), a non-refrigerated Roquefort, a Reblochon, a Cantal (“entre deux” aging), a Sainte-Maure (goat), a Livarot, and a good Comté. And as usual, the meal ends with either a traditional bûche de Noël or, more and more often, a “bûche glaçée”, which can be composed partially of ice cream and sorbets. In fact various “sorbet towers” made of scoops or blocks of sorbets of sophisticated natural flavors (exotic fruits and liquors) made by famous “glaciers-pâtissiers” (like Berthillon) are increasingly popular as Christmas dinner desserts. Wines: What should you choose? That is the most difficult part, because everybody has his own theory about what the most perfect match should be. I will give you some entirely personal suggestions: With foie gras: Most people used to say: SAUTERNES. I would prefer a relatively young red GRAVES (Chateau Ferran 2003 would be a good but not too expensive choice) or a GEWÜRZTRAMINER (2002 from Kuentz). But a good CHAMPAGNE ROSE (Gosset Celebris or Lassalle would be good decently-priced choices) can be very enjoyable with a seared foie gras. If sliced warm with a Banyuls wine reduction, a good slightly chilled BANYULS would be a natural choice. With saumon fumé (smoked salmon): Either CHAMPAGNE brut (Alain ROBERT or GIMMONET, both good quality-price ratio)or POUILLY-FUME (Michot or Domaine de Riaux 2003) With boudin blanc: Either a Roche- aux- Moines from SAVENNIERES (a very fragrant white from the area of Anjou-western Loire Valley), or an ARBOIS ( white from the Jura area). With oysters: Without hesitation, a MUSCADET DE SEVRE et MAINE sur lies . With dinde aux marrons (turkey with chestnuts): a SAINT-JOSEPH (Domaine COURBIS 2002 cuvée spéciale or GUIGAL) a very elegant Côtes-du-Rhône from the Ardèche (chestnut producing area) or a MERCUREY 2003 (Chateau de Chamirey) a very pleasant and flexible red Burgundy from the Côte Chalonaise. With chapon rôti (roasted capon): a CHASSAGNE-MONTRACHET 2002 (white or red Burgundy) With salad: Sparkling mineral water With cheese: It is difficult to have a wine for each cheese. if I had to limit myself to one wine I I would go with a SANCERRE ROUGE (from the center of France), or a SANCERRE BLANC to go with goat cheese With the dessert: The accepted choice is CHAMPAGNE DEMI-SEC. But I do not like it. I would rather have a CREMANT d’ ALSACE. I still have a vivid memory of what the “clochards” (hoboes and homeless people) in French towns in the mid-fifties ate while sitting on public benches located on street sidewalks, in squares and parks, or in the Parisian Metro (subway). They invariably cut pieces of “gros pain” (large pieces of slightly grayish white bread that some bakeries sold by the weight in those days) or slices of baguette with their old Opinel flick-knives, and spread some cheap canned pâté, or ate it with saucisson sec (dry pork sausage). They washed that down with cheap “gros rouge” (a very dark ordinary red wine) directly from the one liter bottle that they kept either in the pocket of their coat or under the bench. I remember the two main brands of these terribly bad red wines, Geveor and Kiravi, because during my student years, they were sometimes the only ones I could afford on financial crisis days. Sometimes they alternated the pâté (or saucisson) with a triangular piece of camembert cheese that they picked directly from its typical wooden box. Quite often the camembert was either very runny because it was too ripe or even slightly decayed if they had picked it up from a grocery store’s disposal bin, and you could smell its pungent odor. And in those days it was not uncommon to find tiny maggots in it. But sometimes, when it was a very cheap camembert, it was all too white and its interior was anything but creamy as it should have been. Its texture and color reminded me of plaster. At home my mother in those days was often buying camembert “made in Thierache”, another dairy producing area 150 miles Northeast of Paris because it was much cheaper than the “real” camembert de Normandie. It was in the late fifties that large co-op dairy groups started to produce camembert and brie in an industrial way in geographical zones other than Normandy. As a matter of fact, camembert was always considered the king of cheeses in France, and until recently was the second most popular cheese (after Emmental) among French consumers. But nowadays, busy younger French families have a tendency to buy more and more often industrially processed milder pasteurized cheeses, including camemberts that they know will stay fresh, firm, mild, and sweet smelling in their fridge for quite a while. And they buy from a refrigerated shelf at the supermarket, rather than at the small traditional mom and pop-owned “fromagerie” (cheese shop) down their street. As a matter of fact, in 2005, 89% of all camemberts were sold in France in supermarkets and only 3% in small “fromageries” shops. It is mainly older people who will ask their “fromager” in these small shops to choose for them a good quality authentic camembert de Normandie au lait cru. And they will ask for a camembert “à coeur”, meaning ripe all the way to the heart of the cheese. According to a well-preserved semi-legendary story, it is a young lady by the name of Marie Harel, who lived in the village of Vimoutiers, near Camembert, in the department (geographical district) of Orne, in Normandy, who was the first to give the famous cheese its modern form around 1791. The secret formula to produce the rind was given to her by a catholic priest from the region of Brie (another cheese producing area about 30 miles south-east of Paris) whom she had sheltered on her farm when he was trying to avoid swearing allegiance to the new republican government issued from the revolution. In fact, cheeses had been made in that area, the “Pays d’ Auge” of Normandy, a country of rich meadows and apple trees, since the 16th century. But the concept of adding a bacteria to the surface of the cheese after salting and before its drying phase to provide its specific aroma during the maturing process and help to obtain this marvelous and edible “bloomy” rind, can probably be dated just after the French revolution. But it will take until 1890 for the camembert cheeses to attain national and international recognition, when a French engineer named Ridel invented the round box made of light poplar wood that allowed camemberts to be stored and transported more easily. These boxes are still used in 2006. First the raw milk is collected and its temperature should not exceed the normal human body temperature. It is poured into vats called “bassines normandes”. Its curdling process is initiated by the addition of rennet. Then the curdled milk is poured, with the help of a special ladle, by hand and very gently, in five passes, into perforated molds to allow a natural drainage. This process can take up to 4 or 5 hours. Then, it is removed from the mold and put on shelves for 6 hours. Then the cheese is turned over and put on a tray. Its surface is lightly salted (with a dry salt) on both sides and a natural bacteria (penicillium candidum or camemberti) is added. Next it is placed to dry on shelves in a special cellar where it will age to almost complete maturation for close to two weeks. Then it is packed in its box where it completes its maturing process for 5 or 6 days before being sent to the point of distribution or retail. It will at this stage of “affinage” (maturation process) probably be ready to be eaten. But to be good it has to be “à coeur” (fully ripened to its heart). It is still a fragile product when it reaches the cellar of the “fromager” and requires its daily attention and several manual and olfactive inspections. Another handicap is its short shelf life: no more than 8 to 10 days. If it goes beyond its normal life cycle, an authentic raw milk camembert’s rind turns brownish, it looses its flat bloomy whitish surface, with light reddish dots or thin streaks , gets dry, its center collapses, and it develops an unpleasant ammonia odor. A very few camemberts are sometimes “affinés” (aged) with either apple cider or “calvados” (the famous apple brandy). But I doubt that you will find any of those at your local supermarket. Growth of the pasteurized camembert market. This fragility and short shelf life are probably the main reasons why, starting in the mid-sixties, the authentic raw milk camembert was progressively replaced by “pasteurized camembert”. The pasteurization (by heating the milk) process allowed the customer to obtain a more stable camembert, whose life cycle could reach more than 30 days from the date of packaging. And it relieved both the distributor and the retailers of many constraints: They no longer had to spend a lot of time watching after the good condition of their camemberts until they sold them. They also saved money with added shelf life, reduction of care in aging and storage, and above all reduced financial loss resulting from cheeses that turned bad and could not be sold. For the cheese producers it also meant that they could make all year long, even when the milk during certain times of the year was less rich, a camembert that would offer consistency in terms of freshness and taste. And of course, it facilitated the export to countries like the United States where the FDA prohibits the import of cheeses made from raw milk, unless they have been aged for more than 60 days. This condition of course is out of question for an “authentic camembert au lait cru de Normandie” aged no more than 3 weeks. The main concern of the FDA is the possibility of getting listeria, salmonella, or E-coli from raw milk cheeses. It happened a couple of times in the past. This is why the plants of the few remaining French producers of AOC raw milk camembert are submitted to extremely tough rules and regulations regarding milk collection, processing, storage, etc. And they have to face very frequent controls by health inspectors. But the bottom line is that pasteurized camembert has none of the qualities in texture and aromas that the raw-milk AOC offers, since the pasteurization process destroys the bacteria that are precisely at the origin of those flavorful characteristics. It is interesting to know that some producers of pasteurized camemberts try to restore the original taste of the raw milk cheese by minimizing the exposure to heat during pasteurization. On the other hand, some producers of raw milk are said to try to limit the risk of listeria in their milk by heating it a little bit. In the late 1930s there were about 1.400 dairies in Normandy producing traditional camembert. According to the French Ministry of agriculture, in 2005 only 40 plants are still producing camemberts in France (118,670 tons) and their production decreased by 3.1% compared to 2004. Some camemberts are produced in other geographical areas of France but cannot be classified as AOC. Even though I could not find precise statistics on the percentages of pasteurized vs. raw-milk, one can estimate than in 2006, less than 10% of the total French production of camemberts is made of authentic AOC raw milk camemberts from Normandy. Only 10 dairies are still making AOC authentic raw milk camembert de Normandie. So, what does a good AOC camembert de Normandie, (if you manage to find one in the U.S), look like, or at least what should a good pasteurized camembert de Normandie look like? Camembert is a fromage à pâte molle (soft-ripened cheese) made of 100% raw or pasteurized cow milk, preferably from Normandy. It is never cooked, nor pressed. Its fat content is normally at least 45% It is packed in a glazed protective paper in its traditional light wooden box. The label on the box should clearly state the brand name, the geographical place of production, which should be in an area in Normandy with a zip code starting preferably with 14 (Calvados) or 61 (Orne), where the best zones of production (Pays d’Auge) are located. The weight of the camembert should be 250 grams (8.8 oz) and it should also appear on the label. On the side of the box a date should be printed, indicating the DLUO (date limite d’utilisation optimale) that tells you that this cheese should be consumed before that date to be at its best. Do not forget that the French put the number for the month after the number for the day. If there is no date but some other numbers, they may indicate for some brands the location of the plant in France, the day of the year when the cheese was packed, and the source of the milk When you open the box, and smell the cheese, you should not get any strong odor, especially not ammonia related. The round cheese should fit neatly in the box and fill it completely. It surface should be flat all over and not irregular with holes in it. If you press the center gently it should not sag but offer a supple resistance. When you remove the paper the surface should be whitish, covered with what we call “fleur” (a sort of light powdery fluffy bloom); it could possibly be slightly granulated, and it probably will show some very pale reddish dots or discontinued very thin steaks. When you cut a portion, forming a triangular shape whose tip reaches the center of the cheese, the ‘‘pate” (the interior part of the cheese) should be uniform and creamy in texture from the rind to the center and have a pale yellow color all the way to the center of the portion. This way you know it is ready and ‘’à coeur”. In no way should the interior be runny and collapse on the plate when you cut the first slice or portion The taste should be flavorful, buttery, mild and slightly nutty or perhaps a bit fruity. Some people think that some camemberts whose milk came from a meadow where apple trees grow might have a faint aftertaste of apple. You can eat the rind if you want to. Personally, I do not eat the side rind. If you do not finish the camembert the first day, wrap it well in its original paper, put it back in the box and keep it in a cool place, but not in the fridge. Eat the remaining piece as soon as possible, during the next two days. To me, the best texture and taste of a pasteurized camembert is obtained when you buy it 10 to 15 days before the expiration date. What breads and wines are the best companions to a camembert? I prefer to eat my camembert with a freshly baked and crusty ‘’baguette’’ rather than with specialty breads like nut-bread, whole wheat, or sour-dough. And I think that the most appropriate wine to drink with a pasteurized camembert is either a good quality Beaujolais-Villages or even better a “cru du beaujolais” like a Brouilly or a Chenas. A Mercurey would also be a good choice. If you were lucky enough to eat an AOC au lait cru, I would recommend a Saint-Emilion or even a Bandol or a young Gigondas. You can eat a couple of slices of Granny Smith or Golden apples with your camembert if you wish. They are almost cousins. If you wish to bake or use camembert in special dishes go to http://www.camembert-aoc.org/, and you will find in the English-speaking version of this site (sponsored by the Union of producers of camembert from Normandy) half a dozen of tasty French recipes for camembert-based tortes, pies, salads, spreads, and crusty snacks. When we arrived in Chicago from Paris in January of 1970, one of my first exploration of the city food landscape made me very depressed: There were no cheese mongers of any persuasion, even downtown, and I found out rapidly that the only camembert available was a canned Danish bland white thing utrageously called camembert. But it did not bear any resemblance with the original. After a year of despair, at my local grocery store in Evanston I found a strange transparent round plastic box that contained 8 portions, nicely individually wrapped, of a cheese called Camembert by DELICO. It was produced by KOLB, a small cheese factory in Lena, in the northwest part of Illinois, and was quite edible. Today KOLB belongs to the BONGRAIN group and produces some ILE de FRANCE products there. We ate that camembert for two years until we found a brie from France sold at Stop & Shop on Washington St. in the Loop precisely under the brand name of ILE De FRANCE. But it probably had stayed for too long in a cold storage warehouse in New York or New Jersey and the grayish color of its rind as well as its strong pungent taste did not satisfy us and we gave up after a few trials. My only comforting moments were when someone would bring back, in a lucky semi-clandestine way of course, some good cheeses bought at Charles de Gaulle Airport. Or when I was attending some wine degustation where French cheeses would be served by local distributors or serious caterers. One of my greatest but small moments of pleasure was at the end of my dinner on the evening Air France flight to Paris, when I opened the portion of camembert BRIDEL that came on my tray. It was pasteurized and over-refrigerated, but after months of deprivation, it was a real treat. Years later, when BRIDEL was bought up by BESNIER (now LACTALIS) this camembert became a PRESIDENT product and lost a lot of its appeal to me. We had to wait until the eighties, to be in a position to locate decent French cheeses in Chicago. But a good camembert was still very hard to find in the early nineties. Only after the new millennium did the tremendous “cheese and wine” fad which enveloped the whole city of Chicago bring us a much wider variety of good, and well cared for, French cheeses. The vital role of serious and knowledgeable local importers like Sofia Solomon, who brought all kinds of cheese to Chicago stores and restaurants, helped a lot. Anyway... About a month ago, I had a sudden craving for camembert, so I decided to do a survey of about 20 grocery, specialty food stores, cheese shops, and wine stores with food and cheese departments, in Chicago to find out what brands and kinds of camembert they were selling. First I tried the two main chains of local supermarkets, JEWEL and DOMINICK’S which over the last 2 years have started to carry a wider selection of imported cheeses, even though they are rarely correctly stored and most of the time are over-refrigerated. The only camembert was the PRESIDENT, from Lactalis, probably the bestseller worldwide. I tried it twice in different stores and was very disappointed. Both were very white, under ripened, rather bland in taste, and their texture was much too firm. No creamy paradise in sight… The price was $ 5.99 but the expiration date in one case was “border line” I was expecting to find a better choice at TREASURE ISLANDS, on Wells St., an old reliable small local chain of grocery + butcher stores that usually carry lots of European food products. But once again, there were only two camemberts available: The omnipresent PRESIDENT that sold for $ 4.00 and whose date of expiration was quite acceptable and a non-descript brand called FLEURS DE FRANCE. I opened one box. It did not reveal any odor and its texture felt to firm. Next I decided to go one step further and to test more sophisticated stores. I started with WHOLE FOODS, a high-end type of grocery chain with an emphasis on organic products. Their store on N. Ashland at School St. used to carry three brands of camembert 3 or 4 years ago: ISIGNY, Le RUSTIQUE, and another one whose brand name I forgot. Today they carry only 2 brands: LE CHATELAIN (a good Lactalis product imported from France) at $ 9.99 each, and DELICE de FRANCE a large wheel of camembert made in France and sold by the piece. The Evanston store sells PERE CAMEMBERT, a product of LACTALIS made in its plant of Belmont, WI. It did not generate any odor when I opened the box and its texture felt too smooth. I did not dare to try it. Their main competitor, WILD OATS, at least in its Evanston store which is the only one I checked, had a few boxes of LE CHATELAIN, selling at a low price of $ 6.99. But the expiration date was borderline. Note: Wild Oats was acquired by Whole Foods in 2007. Then I went to TRADER’S JOE on N. Lincoln Avenue, an interesting store belonging to the very successful Californian chain, which has lots of interesting and cheap imported foodstuffs from all over the world. I do most of my grocery shopping there. They usually sell 4 different types of Brie there. One “private label” made in France which is perfectly edible, one mediocre from ILE de FRANCE, one Canadian, and one American. But until now, only one American camembert, ROUGE ET NOIR. I tried it a couple of times, it’s OK but not really close to a French camembert. But recently, for the holidays, they started to have a French pasteurized camembert LE RUSTIQUE for only $ 4.99, a bargain . I knew that brand, manufactured by the Fromageries Riches Monts that belongs to the SODIAAL Group. And I when I ate it in France, I liked it. But the one I bought at Trader’s Joe was way past it prime. The distributor on the East Coast had probably kept it for too long in its warehouse and it was not enjoyable anymore. I will wait for the next batch to be delivered to try it again. As always I returned to my favorite, FOX and OBEL, a beautiful grocery-butcher-deli-bakery-bistrot store on East Illinois St. which has one of the best selections of unusual cheeses from Europe in the whole city. But to my surprise, they carry only LE CHATELAIN, this time at $ 7.99 each. The date was right (I bought it 12 days before expiration). And it was at the right temperature. This camembert, that according to their web site is “gently pasteurized” meaning low heat, to preserve the traditional aroma, was ‘’à coeur” and was probably the most decent piece of camembert I ever ate in the U.S.
EATZIS, their relatively new and very attractive competitor that seems to be doing good business with young well-to-do clients from the Lakeview and Lincoln Park neighboroods. was the only place in town to carry, to my surprise, one of my favorites: COOPERATIVE d' ISIGNY. But since its date of expiration was "borderline", I did not buy the last one available on the shelf. But I will return and buy one when they receive a new shipment. Next I decided to visit so called “gourmet food shops ‘‘. I started with one of the new ones, PROVENANCE, on N. California. A very nice boutique indeed where the owner, Tracy, knows what she is talking about and has an unusual selection of international foods. They had a camembert from “LIFE IN PROVENCE" a line of imported foods from France managed by 2 French expatriates. It was very disappointing, bland, not creamy, and with a non-descript structure. But it was quite cheap, around 4 dollars each. When I called Tracy a few weeks later, she had dropped this line to replace it by an American “camembert” from Colorado, MOUCO, that she said was very good. She also sells PERE CAMEMBERT. FOODSTUFFS on Central St, in Evanston, told me that in the past they sold DELICE de FRANCE, but they had replaced it with an American camembert from Michigan. I did not try it. GODDESS AND GROCER on N. Damen Avenue did not sell any camembert I tried two other gourmet food stores owned by well-known Chicago restaurateurs and caterers: TROTTER’S TO GO on W. Fullerton Avenue did not sell any camembert at all. COBEY sold only LE CHATELAIN for 10 dollars each. The next step was the specialty cheese stores. PASTORAL on N. Broadway has an impressive selection of artisan cheeses (more than 100), from all over the world including the U.S. But they do not sell any French camembert. Instead they sell an American one from Michigan, RENY PICOT. I am tempted to try it one of these days and will get back to you to let you know about my impressions. THE CHEESE STANDS ALONE, a nice little shop on N. Western Avenue near Wilson, sells a limited but very astute selection of cheeses from both Europe and the U.S. They sell only LE CHATELAIN which, according to the competent owner, is the closest to the real thing you will find in the U.S at this time. I agree with him entirely. Last but not least, I went to check the cheese and deli department of the two largest wine merchants in Chicago: BINNY’s on N. Clark St has a nice and well-presented selection of European cheeses, including beautiful goat cheeses. But its sells only one camembert: LE CHATELAIN again for $ 8.99. The cheese and deli Manager told me that until the FDA changed its opposition to the importation of raw milk cheeses, LE CHATELAIN would be the only decent one to buy there. SAM’S WINE and SPIRITS on N. Marcey St. also had a very nice selection of French cheeses and they are attractively presented and fresh. But they had only LE CHATELAIN and ROUGE et NOIR , an O.K product made for many years in Petaluma, CA. They also sold a camembert made in France and distributed by a French fancy food distributor from the Lyon area called CHANTAL PLASSE. But its $ 12.99 price tag discouraged me from trying it. So we are facing a very strange paradox: In Chicago nowadays, you can find an enormous and very sophisticated array of good quality and even unusual French cheeses from every province, but you have a hard time finding more than two or three brands of decent pasteurized camemberts. One cheesemonger told me that he thinks that people in the Midwest do not know a good camembert from a mediocre one, and anyway prefer Brie because it is always creamy, rich, light in color and does not have a strong odor. "It does not stink", as he said. So my own conclusion is: Be patient. One of these days you will see AOC camembert de Normandie "au lait cru" again in this country. But for the time been, be satisfied with good quality pasteurized ones like LE CHATELAIN, Le RUSTIQUE, or ISIGNY. Update: On Dec 14, 2006 I bought an ISIGNY STE. MERE from EATZIS for $7.99. It was the best pasteurized but authentic Camembert de Normandie I had in a long time: Perfectly "à coeur'', balanced aroma, near to optimal texture. I will go for more. In 2012 WHOLE FOODS asked Hervé Mons a famous ''affineur de fromages'' (professional cheese ager) whose job is to age to perfection various types of French cheeses for demanding restaurants and retailers, to create an authentic camembert that would stay good on their shelves from New York to San Francisco. Hervé Mons supplies great cheeses to restaurants as well-known as Bocuse or Trois Gros. Of course this camembert made for the U.S market it could not be really authentic since the U.S. FDA does not authorize the importation and distribution in this country of ''camembert au lait cru''. Hervé Mons searched for months for reliable dairies and cheese makers in Normandy who would accept to create such a camembert. And they made it. Hervé Mons camembert,sold exclusively in Whole Foods stores in the United States. I think thats it is probably ''thermisé'' meaning that the milk is heated as a temperature which kills bacteria, but not to the point of pasteurization, which kills the typical flavor of a good camambert. Anyway, there are less than 10 producers of authentic Camembert de Normandie au lait cru left in France. It is the only one like and buy in this country. And at $ 9.99 a wheel, it is a bargain. Costières de Nîmes and Vins de pays du Gard: Sunny, comforting and affordable wines for wintry days. Stéphane, You may remember that when you went to this small village in the department (district) of Gard, in Southern France, to watch the Tour de France bicycle race, you enjoyed drinking some very pleasant "vins de pays du Gard" produced in that specific area. Since the departement du Gard is the area where I was born, I wanted to give you a little more info about some of its wines, particularly the Costières de Nîmes that I love. I also wanted to make some suggestions regarding a few vineyards that I like particularly, whose wines you may find in the Bay area. I will mention only those that I found in retail stores in Chicago. The very small town of 3.400 inhabitants where I grew up from 1940 to 1947, Saint-Hippolyte du Fort, was surrounded to the South, East and West by vineyards and olive trees and to North when you started to climb up the Cévennes mountains, by chestnut trees. But these vineyards, most of them belonging nowadays to the appellations of “vins de pays d’Oc” (which represent 33% of the French market for "vins de pays"’), “Vin de pays du Gard”, or a very few to the more specific zonal appellation of “Côteaux du Salaves”, in those days produced a very mediocre “gros rouge ordinaire”. That means that until the mid-sixties these wines were most of the time sold by the local cooperative cellar and consumed locally by people who could not afford any better wine. Or they were purchased in bulk by wholesalers and blended with other mediocre wines to be sold to regional and national distributors who would bottle them under not too fancy brand names found in supermarkets all over France. The few good wines, that in the fifties received a VDQS (a label guaranteeing the origin and quality of this wine) label, then an AOC (label guaranteeing that the wine comes exclusively from grapes grown and harvested in the specific area of the appellation, and is produced and vinified according to very strict requirements) were the Costières du Gard. These wines changed their official appellation in 1986 to become Costières de Nîmes. Starting in the late eighties their growers expanded, diversified, and improved in a very impressive way the types and the quality of the grapes produced in this area. They invested a lot of money in modern equipment, adopted new vinification techniques, and hired consultants who helped them to develop new products and marketing concepts. By the mid-nineties they had reached such levels of sophistication in both terroir characteristics and development of specific aromas, that several of these domaines and chateaux were starting to receive well deserved awards in national and international wine competitions. The first vineyards of the Costières were planted by the Romans during their occupation of Southern France. The area covers 37,000 acres in a zone located between the beautiful old roman city of Nîmes to the North, to the town of Beaucaire on the right bank of the Rhône river to the East, to the marshes of the Camargue to the South, close to the delta of the Rhône River when it reaches the Mediterranean Sea, and to the small town of Vauvert to the Southwest. The vineyards are concentrated in areas around 24 villages, hamlets, and very small towns: Manduel, Caissargues, Saint Gilles, Bellegarde, Beauvoisin, Générac, Meynes, Garons, Redessan, to name a few. But not all the wine coming from this acreage is exclusively labeled as “Costières de Nimes”. Many producers prefer to sell a substantial part of the wines they produce, cellar, and bottle under the label of “Vin de pays du Gard”. Some of them, among the best, are in fact sometimes exported to the U.S. with the name of the varietals printed in large characters in the center of the label: Syrah-Carignan, Grenache-Syrah, 100% Grenache etc. These astute growers discovered a few years ago that the American wine drinkers did not know, or were not interested to find out where the Costières de Nîmes are located, and preferred to buy or order a wine according to its main grape component. And from $ 5.99 to $ 10.99 for the vins de pays. Hey, Stéphane, your mother who, as you know, covers the restaurant scene in Chicago for CHICAGO COLLECTION Magazine has compiled the following list for you. You'll see that most children's menus cater to the simple tastes of kids who don't like to wander far from burgers, chicken nuggets, mac and cheese and pizza. It's reassuring to know that they won't be any fussing and whining when you take them out to eat with you. A lot of restaurants also have activity placemats and crayons to keep their minds and hands busy before the food gets to the table or when the kids decide they've had enough to eat. In France when children eat at home with their families, they're expected to eat what's put on the table, like it or not, and often they learn to like it. Now in the U.S. I see a growing number of youngsters with more sophisticated palates who are willing to take risks and try new foods. Before these kids were born their parents were used to eating out regularly at casual and fine dining restaurants and ethnic spots and now they see no reason not to bring their little ones out to eat with them. These are children who are taken shopping at farmer's markets and health food stores. They are being nourished with organic produce and free-range chicken They are already watching the Food Network instead of Nickelodeon and taking cooking classes that go beyond the basics. These youngsters are happy to find menus for their age group that include such items as salmon, green vegetables and fresh fruits. They are the ones who will insist on sampling the dishes their parents order: the duck pate, the risotto, the souffle and the sushi, the baba ganooush and the avgolemeno soup. These are the kids who are in training to be our future chefs, food critics and demanding diners who will settle for nothing but the best. In the mean time here's the simple and more sophisticated fare they can expect to find on children's menus. Ambria, 2300 N. Lincoln Park West, 773-472-5959. Well-behaved youngsters (ages 5 and up) can learn a bit about fine dining and perhaps about the Art Deco style of the setting of this elegant place. First they will discover the art the amuse bouche when the waiter brings this small morsel of food that shows off the chef's creativity before the dinner gets under way. Youngsters can order a steak, a piece of fish or a grilled chicken breast perfumed with herbs all served with frites. They will eat their entree while the adults at their table enjoy appetizers. Then the children disappear into the kitchen where they don a chef's hat and make a dessert with a little advice from the pastry chef. Reservations for the Four Star Kids menu, which is $19.95, are a must. American Girl Place Cafe, 111 E. Chicago Ave., 877-247-5223. This is the girliest of girly-girl places. Young girls who don't bring their American Girl dolls and aren't dressed in outfits matching the ones worn by their playthings representing historic periods will probably feel out of place. The cafe has a beautiful view of the historic Water Tower but girls probably won't even notice because they'll be too busy playing with their dolls who have their own mini seat at the table. Items on the lunch, brunch, afternoon tea and dinner menus include some inspired by the dolls such as Felicity's egg salad sandwich and Molly's Victory Garden chocolate mousse served in a tiny flowerpot. Adults will find grown-up food including fish and chicken dishes. Since many young diners are more interested in playing make-believe than eating, this can be an expensive experience that's not very nourishing. Ben Pao, 52 W. Illinois St., 312-222-1888. Some of the Asian dishes on the kid's menu, such as crispy chicken bites and chicken noodle soup, sound familiar, but the flavors might be new. Griled chicken skewers and Beijing beef are other options. They are all served with fried wontons and sweet and sour sauce which are a bite like snack food and a good old American soft drink. You can print out a coloring page of a dragon from the restaurant's webpage (ww.benpao.com) that the child can color the dragon, which stands for good luck, at home and take it to show it off at the restaurant or simply take it there to work on it. Big Bowl, 60 E. Cedar St., 312-640-8888; 60 E. Ohio St., 312-951-1888; 215 Parkway Dr., 847-808-8880; 1950 E. Higgins Rd., Schaumburg; 847-517-8881. Most children today are used to eating Asian food so they'll feel right at home. The extensive menu for them offers easy to eat golden chicken nuggets that are a far cry from those from the familiar chain. They are served with red peppers and a sweet and sour orange sauce and jasmine rice. The combo of 2 chicken satays and 2 chicken pot stickers is great for nibbling and the teriyaki salmon is great for fish-eaters. They can eat with special chopsticks that are a cinch to use and spend spare time using crayons to play Asian-inspired games on the kid's menu. Bistro 110, 110 E. Pearson St., 312-266-3110. Kids will feel at home at this bustling spot where murals line the walls. The menu for them includes simple fare such as angel hair pasta with marinara sauce, a small beef tenderloin served with french fries or vegetables and mini burgers. They might be more than willing to start their meal by trying the complementary oven-roasted garlic spread on a piece of French bread. Grown-ups can go for a classic steak au poivre or the signature lamb shank which has been cooked in its own juices for 18 hours. Brasserie Jo, 59 W. Hubbard St., 312-595-0800. Eating is fun and games for kids at this big, bustling 1940s-style place where the menu for youngsters is on the back of an Etch-a-Sketch. Parents can order robust Alsatian specialities from chef Jean Joho's creations such as tartes flambees and Riesling chicken, while children can choose from simple healthy fare such as chicken with mashed potatoes, salmon with asparagus, a grilled cheese with frites and followed by chocolate mousse for dessert. Chicago Diner, 3411 N. Halsted, 773-935-6696. Kids probably won't even know that this retro style diner is a meat-free zone. The kid's menu at this vegetarian spot has a peanut butter and jelly sandwich and a grilled cheese and a so-called Not Dog. They all come with a choice of homestyle potatoes, the veggie option of coleslaw or brown rice which might look a little strange for those who have only eaten the white grains. Deleece, 4004 N. Southport Ave.; 773-325-1710. This friendly neighborhood spot draws people of all ages who feel right at home in the casual setting with natural brick walls and bouquets of flowers. Kid's can settle in and choose from simple fare such as a grilled cheese, chicken tenders or a cheeseburger, pasta or cheese ravioli, served with fresh fruit and a scoop of vanilla ice cream to finish the meal. At the popular Sunday brunch French toast or scramble egg served with potatoes and some toast. Frontera Grill, 445 N. Clark, 312-661-1434. The kid's fare here is a giant step above Mexican fast food. Chef/owner Rick Bayless is known for using fresh, local ingredients to make top-notch regional fare from south of the border. It's easy for little finger to dip chips into guacamole or salsa even if it can get a little messy or they can squeeze some lime juice onto slices of jicama. This is the place to introduce them to Mexico-City style quesadillas stuffed with Chihuahua cheese and a choice of black or pinto beans crispy taquitos filled with chicken topped with housemade sour cream and Mexican cheese. Greek Islands, 200 S. Halsted St., 312-782-9855. Young ones are more than welcome in this place which is like an open house where members of the oldest and youngest generations of Greek families and those in-between gather around the table for lively conversations and good food. Youngsters should be introduced early on to the pleasures of olive oil, garlic and lemon, the basics of Greek cuisine. Thin, crispy slices of fried zucchini are easy to eat one at a time and can be dipped in skordalia, made with mashed potatoes redolent of garlic. They can choose half orders of dishes such as chicken riganati with rice and potatoes or thin, flavorful slices of gyros which are perfect "baby" foods for those ready for herbs and spices. No meal should start without saganaki, a slice of Greek cheese dramatically set aflame tableside by waiters who theatrically shout "Opa." John's Place, 1220 W. Webster St., 773-525-6670. This casual place is a great success with the stroller set. The kids' menu has all the basics to keep little ones from getting fussy: a grilled cheese, a chicken hot dog , dino bites, mac & cheese and pasta with tomato sauce. They come with a choice of french fries, mac & cheese (parents can help kids make judicious pairings) or healthy seedless red grapes that are easy to pop into small mouths. Red Rage and Yellow Moon smoothies, chock full of fruit, make another healthy choice. The menu is written on a place mat full of fun and games and crayons are ready and waiting. Maggiano's Little Italy, What's not to like on the children's menu ? Kids can choose from a pizza, chicken fingers, spaghetti with just one manageable meatball. The cheese ravioli might be a little bit more unique but they're cute to look at and they topped with marinara sauce that they will recognize. A map of coloring map of Roma with some interesting facts about the Italian city is food for young brains. Marche, 833 W. Randolph St., 312-226-8399. Marche has always been popular with hip, young professionals, but now they're bringing their children along with them who feel right at home at a place that has the look and feel of a 3-ring circus with an open kitchen as part of the show.. Chef Paul Wildermuth has concocted a menu for the little ones that merges simplicity with sophistication; the grilled cheese is made with brioche bread, the hamburger is grilled over fruitwood and the macaroni and cheese is more than a cut above ordinary Kraft. Mon Ami Gabi, 2300 Lincoln Park West, 773-348-8886; 260 Oakbrook Center, Oak Brook, 630-472-1900. Kids can soak up the atmosphere of a Parisian bistro and savor a traditional steak frites from the Little Frites children's menu. Other choices for youngsters appeal more to American tastes even though they can now be found in fast food places in France. They include a hamburger, a cheeseburger, chicken fingers and a hot fudge sundae. But pint-sized sides of mashed potatoes, spinach and green beans are French classics. Before kids get a chance to squirm and whine when they arrive, they are served an amuse bouche of small bits of food arranged on a plate to look like a smiley face. The French would probably not approve. The children's menu doubles as a place mat with French-inspired activities to nourish the intellect. Prairie Grass Cafe, 601 Skokie Blvd., Northbrook; 847-205-4433. Co-chefs and partners Sarah Stegner and George Bumbaris, who created award-winning cuisine at the Ritz-Carlton, now bring their culinary talents to this casual place where you can almost hear the beat of the Heartland. Plasma screens show images of prairie plants and native flowers and the dishes are inspired by seasonal ingredients from local farmers. Kids can kick off their meal with the combo plate of raw sliced vegetables and fruits and chunks of cheese. Entrees range from mac and cheese and a mini pizza to a breaded chicken cutlet with mashed potatoes and a small filet mignon from free-range, prairie-grass fed beef raised on the Kansas ranch of TV news journalist Bill Kurtis. Scoozi!, 410 W. Huron St.; 312-943-5900. Kids feel at home in this boisterous place where they are invited into the kitchen on Sundays between 5 p.m. and 6:30 p.m. They get to wear a chef's apron and hat while they put together a complimentary pizza for themselves. While the pizza is in the oven they can delve into a big bag of toys to find something to play with before it's time to eat. While everyone might want to play chef-for-a-day, the pizza-making is limited to those age 12 and under. It's best to call ahead to make reservations. Sola, 3868 N. Lincoln Ave., 773-327-3868. Carol Wallack, a surfer who worked side by side with her sister at Deleece (which also has a children's menu) has now set sail on her own at this casually elegant spot where she adds a California/Hawaiian flare to her cuisine. Grown-ups can enjoy artichoke fritters with soy lime and white truffle honey sauces and miso black cod while their off-spring will be more than happy with the simplicity of a chicken breast (no nuggets here) served with easy-to-eat mashed potatoes and a few healthy peas and carrots, an up-scale version of the old stand-by mac cheese is made with three cheeses and a grilled cheese comes with fresh fruit and a choice of tomato soup or fries. All dishes come with some crayons to keep young hands and minds occupied. If the kids are too rambunctious, you can take advantage of the restaurant's curbside carry out. Just call ahead to order and someone will deliver the food-to-go when you drive up in front of the restaurant. Wishbone, 3300 N. Lincoln Ave.; 773-549-2663. Let the good times roll could be the motto at this place that serves up down home Southern cooking with a good measure of noise. The menu offers blackened this and blackened that, grits, crawfish and Cajun spices. The kid's menu offers a traditional American burger made from hormone-free, locally raised beef but also Southern-style dishes such as a Midget John, a mini portion of Hoppin' John that combines black-eyed peas, rice and gooey cheddar cheese served with a corn muffin. Fussy eaters can order the Rabbit Patch includes a choice of three sides. There is a curfew on the children's menu which is retired after 7 p.m. Wolfgang Puck Grand Cafe, 1701 Maple Ave., Evanston, 847-869-9653. Kids may not want to follow in the footsteps of Wolfgang Puck who launched the concept of gourmet pizzas (think glamorous ingredients such as smoked salmon and caviar) which were must-haves for Hollywood celebrities who flocked to in his restaurant, Spago, on Sunset Strip. But at his Evanston spot youngsters can become the chefs and use their own imaginations to pick toppings to put on their own pizzas. They can find a place at the counter to make their own pizzas during restaurant hours except on Fridays, Saturdays and Sundays after 4 p.m.
What restaurants in Chicago would welcome families with young kids? One of the things I missed the most when I moved from Paris to Chicago in January of 1970 was the cafés. Of course I found some interesting bars in my new town and I spent hours in some of them. The Anvil on Michigan Avenue where many old reporters from the nearby Chicago Tribune told fascinating stories, Ricardo's on Rush where the bartender knew everybody by name, The London House on East Wacker Drive and Michigan Avenue, where we would sip beer and have a sandwich during lunch hour while listening to Ramsey Lewis or Sonny Rollins playing live jazz music. Farther away from my office was O'Rourke's on North Avenue where the atmosphere was dark but often intense from boozy dialogues between regulars. I would listen to their conversations, but did not understand half of what they were saying. It was my way of learning the American language that I did not speak at the time. Later on, when I started to feel more comfortable speaking English, I got more involved talking with other patrons, while developing a solid taste for good bourbons. But nevertheless, in those days, except for Melvin on State Street, there were no cafes with a "terrasse" where you could sit on warm summer days, sip "pastis" (an anise flavored yellowish alcoholic drink) while reading "Le Monde" and wait for your friends to show up and sit down with you to discuss the latest French film or the political scoop of the day. Cafes in France play a very important role in your daily life. Whether or not they have a terrasse on the sidewalk, are a simple "bar-tabac" at the corner of two busy steets in a blue collar neighborhood, or a fancy two centuries-old grand cafe in Saint-Germain des Prés in the 6th arrondissement in Paris, you are sure to meet people you know there, or that you will eventually get acquainted with, starting with the "patron", the owner. When we lived on Rue de Seine near St Germain des Prés in Paris in the sixties, one of our favorite patrons of a bar-café was Monsieur Constant. He was a very short guy in his late fifties sporting a bushy gray and yellow mustache and wearing the same old uniform practically everyday: baggy corduroy pants, a tired and dirty grey flannel shirt that looked like the top of old-fashioned underwear and was always full of stains .He walked very slowly, at the rare times when he left his position behind the small real zinc covered counter, in his peasant galoshes. He had the nasty habit, twice per hour, of searching the pocket of his apron for a pinch of snuff tobacco that he extracted from an old leather pouch.He then inserted it into his nostrils and sniffed his snort noisily. But it would not stop him from continuing to serve marvelous wines from the Loire valley (he probably had the best Coteaux du Layon in Paris) in semi-clean old-fashioned small glasses that he would rapidly rinse before drying them with the same dirty cloth that he sometimes also used to wipe out debris from the counter. A few minutes later he proceeded to clean his nose again very noisily in a very large and dirty handkerchief. He had a very strong accent from his native Auvergne and rolled the r's. But he was a beauty of a human being , and some people came from the other side of Paris to drink his wines from small unknown vineyards. His cafe was not decorated, had only a couple of small table and chairs, and was lit by old gas lamps hanging down from the ceiling and one very weak electric bulb. From time to time the smell from the laundry that his wife was boiling every other month in a large tin basin in a tiny backroom behind the cafe's main room would mix with the odor of the cabbage and pork soup that she was preparing on a coal-burning stove in that same backroom. And it would be on some occasions so overpowering that you needed a strong calvados to suppress the gag reflex in your throat. When you entered Monsieur Constant's cafe the first thing you noticed was a few bags of coal standing up against the wall across from the counter. Because Constant was one of the last authentic traditional ''bougnat'' of Paris who sold wine and coal, like all the other bougnats did before him since they started emigrating to Paris around 1820 from their native poor rural areas of the Auvergne where they could no longer find work or maintain their small farms and feed their families. The majority of them came from 2 "departements" (geographical districts): Cantal and Aveyron in South Central France. These hard-working auvergnats first started to sell coal to Parisian households, but rapidly they expanded the activities of their tiny shops by also selling wine, and later they became full-fledged café owners. Many of them occupied small apartments above the cafe.180 years later the heirs of these "bougnats'' had managed to control the largest share of the lucrative Parisian market of cafés and restaurants. In fact some ''auvergnat" owners of famous cafés and brasseries, like the brasserie Lip, Les 2 Magots, Flo, Le Procope, Au pied de Cochon, Chez Clément, and many others have created real dynasties and powerful groups of restaurants and cafés all over Paris, and even in some other large French cities. It has been estimated that people from Aveyron (there are 320.000 of them in Paris) control 6,000 hotels, restaurants and cafes in Paris and its suburbs. Another interesting community of cafe-owners were the Bretons (people from Brittany). Most of them had their establishments in the area north of the Gare Montparnasse, the train station for railway lines going to Western France, a neighborhood were most "Bretons" lived. In the late forties and early fifties one my favorite sports heroes was the French bicycle racer Jean Robic who was from Brittany. When he retired he got himself a cafe on the Boulevard Edgar Quinet behind the Montparnasse train station. The first time I went to Paris by myself I was determined to go to see that cafe. When I entered I could not see the cyclist and ask a waiter if he was actually there . Of course, he replied, can't you see him behind the bar? All I saw was a head, he was very short, behind that counter and two hands lifting a glass towards the ceiling light to check if it was clean. That was Jean Robic .. Many famous French sports celebrities owned bars and cafes in France in the fifties. In lower-middle-class districts it is very frequent to observe odd partners standing and drinking at the same time at the counter: the mailman, the local baker, the butcher, the cop whose beat is limited to a few streets around the bar, the drivers of delivery trucks, the local wino or semi-"clochards" (hoboes), and even perhaps a prostitute taking a break between two customers. So, you may engage in a short but lively conversation with an unknown but colorful character at the "zinc", the "comptoir"(counter),which most of the time is covered with a shiny coating of copper that the bartender never stops wiping with his "torchon" (a piece of cloth). People stand at the comptoir to have a quick expresso, or a "demi" (less than a pint) of beer, or a "pousse-café" (after dinner drink) to help them start their afternoon after having lunch in the backroom. These countertops used to be made of thick grey zinc, and the nickname stayed. When a friend or neighbor asks you if you want to have a quick "apéritif sur le zinc", it means drinking a before-lunch cocktail at the bar of the nearby bar-tabac or cafe. And if you are reluctant to accept because you do not have much time you answer: "D'accord, mais sur le pouçe" literally translated: Fine, but on the thumb...which means in fact: "O.K. but let's make it fast". Practically every cafe or "bar" has a counter, except in large old style "grands cafés" or cafés-brasseries in big cities, like The Café de la Paix or Les Deux Magots in Paris, where everybody sits at a table, for two or four, or sometimes for more people in small cities or villages cafes. In traditional cafes you also find long communal seats called "banquettes", most of the time made of colored leather or faux-leather (moleskine). The bar-tabac got its name because, once inside the cafe, the first thing you notice is a special enclosed section at the end of the counter, close to the entrance door, where a person, quite often the wife or a relative of the owner, sells tobacco products like cigarettes, which are distributed by a state monopoly in France and are not sold in supermarkets or out of distributors. You can also buy all kinds of different products at this special "tabac" section of the bar: Candy, lottery tickets and games, lighters, tiny toys, souvenirs, postcards, stamps, knives, pipes, pens, etc. They often stay open late. And at all times of day, people who come to buy cigarettes, also have a quick beer, a cup of expresso, a coke or a glass of wine before going back to their work or occupation. Nowadays sophisticated expresso machines are everywere, but until the early sixties, the only equipment to make coffee in a cafe was the huge "percolateur", a shiny silvery small steaming tower that waiters wiped to a permanent shine with their "torchons" 24 hours a day. Until the late eighties, every Sunday morning, from breakfast time until noon, all kinds of men and women used to sit at tables and fill out their special forms to play the "tiercé'', a famous horse race which took place in the afternoon at one of the two Paris hypodromes (race tracks): Boulogne and Longchamp. They queued at a table in one of the rooms of the cafe to register their form and place their bet with one of the official agent of the betting agency, which was controlled by the government. The conversations were often very animated since the players drank a lot while preparing their bets. In bars and cafés, lots of workers have breakfast at the counter in the morning, eating fresh croissants, or "tartines beurrées" (a buttered sliced portion of a baguette) that they dip in their "café-crème" (latte) or hot chocolate. But some people feel thirsty even at this early hour and it is not rare to see them drink a couple of demis (a little less than a pint) of draft beer before going to work. In old working class neighboroods you can still find some men having a "blanc limé", a glass of dry white wine tamed-down with limonade (a lemon-flavored seltzer) or even a small shot of calvados, a 90 proof apple brandy from Normandy to help them get energized before getting into the subway to go to their factory or construction site. Many people also have a quick lunch at the counter or sitting down at one of the few tables, usually a paté or ham sandwich with cornichons (small pickles) or maybe a croque-monsieur grilled by the owner or the waiter in a small electrical toaster-oven. Some bar-tabacs and cafés also offer omelettes, "assiettes anglaises" (a platter of assorted cold meats with "cornichons") and sometimes hot dogs. Many of them used to have a special device consisting of a warm steel rod on which they heated a portion of baguette in which they inserted the wiener which was kept hot in a glass steamer. And in old-fashioned cafés you still can grab an "oeuf dur" (hard-boiled egg) from a special egg-holder always present on the counter, and eat it with a glass of wine. The conversations are usually less intense in a bar-tabac than in a regular café where people often sit down at a table to read while they have a drink or meet with friends. But some people take the time to read the morning papers while drinking their coffee at the counter. Some make comments about the political situation or a crime to the waiter or to other customers if they know them a bit, which is often the case since most patrons are regulars and live or work nearby. The traditional cafe also has often a "comptoir" behind which reigns the "patron" who often prepares drinks that the waiters take to the seated customers, and serves standing customers. The "patron" (owner) shakes hands with all his regular customers and calls them by name. Sometimes, in very traditionnal places, his wife, "la patronne" officiates at the end of the counter behind a cash register where she prepares the "addition" (check) and provides the change due that she gives to the "garçons", the waiters.But the major part of the room is occupied by tables and chairs. In most traditional cafés, people come to drink, relax and chat. In the smaller ones in small towns and villages customers also play cards, or dominos and in some establishments in the South of France they stay outside to watch games of "boules" called "pétanque", or to play themselves.. The team that looses the game has to pay a round of apéritifs, often pastis, to the other players. I miss these Southern cafes with a pétanque court outside a lot. Very often the cafe is named after its precise location, street, square, avenue, or because of its proximity with a public building, a train station, a theater, or many stores and shops, or the statue of a famous native son: Café de l'avenue, Café de la Gare, Café du Commerce, Café de la Mairie, Café Napoléon. Sometimes the name was chosen either because it used to be a place where local business owners would congregate, where traveling salesmen would stop, or where sports fans would get together to watch a game on TV: Café des Négociants, Café des Sports. Or it would be named simply Café des amis (friends). But in Paris as well as in many other French towns and villages the cafe is often named after its owner and might be called "Café Langlade" or it bears only his first name or nickname preceded by "chez": Chez René, Chez Jojo, Chez Joséphine. Most cafés used to be full at the time of the apéritif before lunch (11:30 AM to 12:30 PM) or before dinner (6:00 PM to 8:00 PM) and in large cities late at night after the end of a theater show or after the last movie show. The people would get together to drink beer or brandies and discuss what they had just seen with friends. But nowadays in most French cities you find people in cafes practically all day long, especially young people and students, some of them spending hours to talk and organize their evenings. Others like to go there to play electronic arcade-type games.You still can find some old American pin-ball machines that the French call "flippers" In practically every major French town, a few cafés stay open very late at night and sometimes all night long. It is often the case in large cities near the main train station or at the edge of town where the highways start or converge. And in Paris, until the late sixties when the centuries-old "Les Halles" vegetable, fruit and meat central market was relocated to Rungis, a suburb close to Orly airport, there were very lively night-cafés and brasseries open in that incredibly picturesque neighborhood close to the center of Paris. There, workers for the market, purveyors and wholesalers, some of them dressed in white uniforms covered with blood stains from cutting and carrying large pieces of meat, would stand at the counter of these cafes in the middle of the night to eat and drink. They would rub shoulders with tourists, clochards (hoboes), ''putes'' (whores), students and bourgeois Parisians in their elegant outfits, having a last drink or eating something with friends after a party, a concert or a show. The famished and poor student that I was at the time in 1963 used to go to '' Les Palmiers", Rue des Halles to eat enormous "saucisse de Toulouse" (pork sausage) sandwiches with french fries. It was greasy but delicious and comforting after an evening spent working on a philosophy essay due the next morning at La Sorbonne. A couple of years earlier, when Nancy and I were studying in Aix-en- Provence, we loved to go to a seedy bar, The Gambrinus, which was open all night long, at two in the morning to recover some strength with marvelous ''oeufs sur le plat" (fried eggs) that they served in small white individual enameled cast-iron pans. We washed down these frugal snacks with ''ballons'' (round glasses) of red ''Côteaux d'Aix en Provence", or beer. The place, which had none of the atmosphere depicted in Van Gogh's famous "café de nuit" painting, was totally unattractive and very noisy, was in fact not too safe with a client base of rough truck drivers, motorcycle bikers, semi gangsters, cops, and all kinds of strange characters... But the owner, a short and very bulky but friendly fellow who was a former wrestler and did not get easily impressed by drunks or bullies, knew us and sometimes treated us to a free drink. Most cafés do not generally serve food, except croissants and sandwiches, unless they are clearly marked "café-restaurant" which means that one part of the room or a separate room is entirely dedicated to diners at meal time. The brasseries are relatively large café-restaurants that you find in busy commercial areas of cities, around the train station, or on major avenues. They serve drinks and specific "plats de brasserie" such as steak-frites, choucroute garnie, poulet roti, salade composée, petit salé aux lentilles, andouillette grillée, cheeses, and charcuteries variées, all day-long.They used to specialize in beer, but nowadays offer a limited but often interesting list of "vins de pays" in carafes and by the glass. Even though many French people still say "let's go to the nearby bistro to have a drink", most educated people call bistrots (or bistros) a small restraurant where you eat "cuisine de bistrot", focusing on traditional French recipes including many slow-cooked dishes in sauces. The term " bistro" comes from the Napoleon wars period when Russian soldiers in Paris would rush into small local cafés, go the counter and loudly order something that they could drink or eat in a hurry. They would yell " Bistro, Bistro..." meaning quick, quick. One of my favorite café-restaurants when I go to Paris in my adopted 15th arrondissement is " La Tour Eiffel" at the end of Rue du Commerce facing the St. Jean Baptiste Church, which has open French windows from May to October. That means that quite often you can have lunch in the sun inside the dining area of the cafe. Nicely decorated with beautiful old photographs showing the various stages of the construction of the Eiffel Tower, this place owned by "auvergnats" can at lunchtime be very crowded and smoky. But the waiters are very efficient and service is fast. They serve very tasty rustic dishes like confit de canard with lentils, salades auvergnates with Cantal cheese and a delicious air-cured mountain ham from Auvergne, and basquaise chicken. I also like to meet with friends in old-fashioned "bistrots à vin", small cafés that specialize in good regional wines from small family-owned vineyards and serve quality ham, patés and terrines, dry regional saucissons, and "rillettes", as well as good cheeses on rustic bread. My favorite in this category is "Au Sauvignon" 80 rue des Saints-Pères in the 7th arrondissement near Sèvres-Babylone. The walls of this very tiny café are beautifully decorated with rustic mural paintings representing life in a wine producing region. The service is very pleasant. They serve beautiful Quincy, Reuilly and Sancerre wines by the glass. Last but not least I miss the "grands cafés" . They have existed since the 17th century. The Cafe Procope, Rue de l'Ancienne Comedie, now is sort of a tourist trap of a restaurant, but we used to enjoy having a simple bistrot dinner there in the sixties. It was started in 1686 by an Italian immigrant,and is supposed to be the oldest cafe in Paris. In the 18th century it was the most celebrated meeting place for literary luminaries like Diderot, revolutionaries like Danton, and later well-known writers and poets such as Balzac and Verlaine. When I was young, the grands cafes were very stylish with waiters who wore tuxedoes or the traditional "rondin", a long white apron, along with a black vest and bow tie. They would bring your drink on a porcelain saucer on which the price of the drink would be printed in red or black. Each time you ordered a new round of drinks the waiter would pile the saucers up on your table, and when it was time for you to pay and leave he would calculate your bill by adding the prices printed on each saucer. If you wanted to read a newspaper you had to go to one of the racks on the wall near the counter or the entrance and choose one which usually was clipped to a long rod of varnished wood. In the large cities of France, cafes usually were known for the political preferences of their patrons, and the regulars would totally despise the customers of the cafe located on the other side of the street or the square, since they were suspected of having a different political affinity and voting for the wrong guy in local elections. It is also interesting to notice the slow but noticeable evolution of the favorite drinks consummed in these grands cafes. From absinthe at the turn of the 20th century, to Suze, Picon, Dubonnet, and Noilly Prat vermouth, Guignolet Kirsch, and later Pernod in the thirties, forties and early fifties. Then Port, Sherry, Scotch, Pastis, and Martini and Rossi vermouth became popular in the fifties and early sixties. Since the late sixties, every French bar and cafe has several automatic dispensers of various whiskies, that people order sometimes as " un baby" which means "a small measure". But young people drink a lot of sodas and mineral waters. When I was a student in Aix en Provence our favorite grand cafe was "Les Deux Garçons" on the Cours Mirabeau with its very high ceilings, beautiful mirrors and Louis-Philippe-period interior decoration. Unfortunately it was sold in the eighties to people who did not keep the original decor, and fired most of the the old fashioned waiters that everybody knew by their names. Some friends who recently had a drink there told me however that the place had been redecorated to match its former splendor. The owners also modified the simple but fancy brasserie menu that opera-lovers enjoyed with champagne after an evening at the famous summer Mozart music festival on the fabulous terrasse where everybody wanted to see famous or infamous people from all over the world, and of course to be seen. During the school year this terasse was an interesting mix of students and professors, artists, and actors, politicians, and foreign visitors. The two rooms inside were very quiet in the morning and I used to go there to have a coffee, eat a croissant and read the local paper, Le Provencal. One grey winter morning, I was doing exacly that when 3 people came to have breakfast at the table next to mine. First I was attracted to the very expressive eyes of the lady who was seating on the chair opposite me. I recognized her after a while: She was the famous Spanish movie actress Lucia Bose. I also, being a "corrida de toros afficionado", immediately regognized the very attractive gentleman seating next to her, it was Luis Miguel Doninguin, a famous matador. But it took me more time to find out that the third person in their party who was sitting, two feet from me, on the "banquette" and drawing little, not really fully shaped, patterns on the paper table cover was in fact Pablo Picasso. I could not concentrate very well on my reading while I listened to their conversation. They had come to attend the shooting of a film by their friend Jean Cocteau, "The Testament d'Orphée" in nearby Les Baux. When they had finished their breakfast, they put some money on the table and left. I was looking, mesmerized, at this piece of paper within my reach covered with all these little graffitis drawn by the old master, wondering if I would muster the courage to tear it off and keep it. But I was not fast enough. The waiter came to clear the table, crumpled the paper table cloth on his platter and disappeared in the kitchen without realizing what he had destroyed... 45 years later I still regret my lack of judgment and determination. When I moved to Paris in 1963, and attended the Sorbonne, I walked all the way (about 8 blocks) to Saint Germain des Pres to drink a coffee at the famous " Les deux Magots" located 6 Place St. Germain des Pres in the 6th arrondissement. This place with its very large terrasse facing the beautiful romanesque church, used to be a Chinese silk shop in the 19th century. The new owner who took over the place in 1875 and transformed it into a cafe, kept the name and the 2 magots (small chinese statues). During and after World War I, this cafe had become the most famous litterary cafe where famous poets and writers, from Rimbaud and Verlaine, to the Surealists, and later Sartre and Simone de Beauvoir, as well as artists and actors, used to spend hours drinking, meeting friends and admirers, and sometimes writing. In the sixties you had to go to the basement of Les Deux Magots to visit the restrooms, or to use the telephone. A great game at the time was to call the lady in charge of both the "Toilettes" and the telephone booth and ask her to call a certain person having a drink in the cafe upstairs to come down and answer the call. So it was very funny to hear her announce seriously on the PA system: " On demande Monsieur Proust, (or Monsieur Welles, or Monsieur Alain Delon), au telephone". Many people used to come at least 10 times a day to les 2 Magots just to show off with their new outfits, car, or dog, or to parade a new "partner"... Some aging former celebrities would sometimes spend a whole day at a table inside, talking with former "fans" and reading or pretending to write. Some relatively obscure poets and writers, like Maurice Fombeure, literally held court at the Deux Magots until the mid-sixties. I stayed at his table drinking coffee many times. Above all I used to enjoy listening to the many street musicians and singers, as well as excentric "self-created" or wanabee philosophers and politicians who came to do their number several times a day on the sidewalk. I still visit all these establishments on occasional pilgrimage trips. But when I come back to Chicago it is more the "spirit" of these places that continues to survive in me than their actual physical image.